Honey dripping from wodden spoon. Recent research shows that honey may be more effective at fighting infections and healing wounds than some of the most commonly used medical treatments. While scientists are still struggling to understand why some types of honey possess the abilities to fight bacteria and inflammation, many suffering from acne scars are testing this ages-old remedy on their damaged complexions. 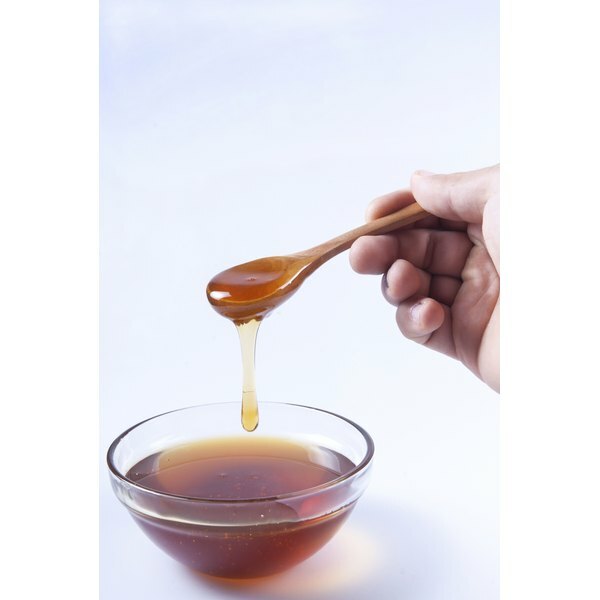 But there are many things to consider before using honey to combat acne scarring. According to the Journal of the Royal Society of Medicine, evidence dating back to as far as 2200 BC shows that the ancient Egyptians included honey in their prescription for standard wound care. Out of 900 Egyptian remedies, more than half called for some amount of honey. Early writings and artifacts also indicate that the ancient Assyrians, Chinese, Greeks and Romans also used honey to treat wounds. Honey's presence in the medical field began to die out in the 1940s with the advent of antibiotics, but is undergoing somewhat of a revival in the 21st century as doctors turn to the natural infection fighter to handle bugs resistant to modern medicine, such as acne scarring. A pimple, whitehead, blackhead or cyst is the result of clogged oil glands that become havens for bacteria. Normally, this bacteria resides underneath your skin but does not cause problems until that oil gland becomes clogged. The bacteria then feeds on the oil and multiplies, inflaming the skin and giving rise to acne. Scientists have several theories on why honey may help disrupt this process. One suggests that since sugar has a high osmolality, water is attracted to it. Bacteria need water to grow, so when the sugar is applied, the bacteria is deprived of the water it needs to flourish. Another theory suggests that a chemical reaction occurring between the glucose in the honey and the secretions oozing from the wound slowly form hydrogen peroxide, which kills bacteria. In 2001, researchers from the University of Oxford compared burn patients that had been treated with honey to those that were administered an antiseptic and found that honey was significantly better. Those that were treated with honey had much shorter times for healing, eradication of infection, needed less use of antibiotics and spent fewer days in the hospital. To date, however, no studies have been published regarding honey's effect on acne scars. "There is no reason why it would work, so I imagine that is why no one will fund a study," says Lisa M. Donofrio, MD, associate clinical professor of dermatology at the Yale University School of Medicine. Although honey has had some success in the treatment of ulcers, burns and other skin irritations, dermatologists argue that treating acne and the unsightly scars it leaves behind, is more complicated. Genetics, sebum production, inflammation and bacterial growth are just some of the many factors affecting the treatment of acne. If honey has any place in the treatment of acne scars it would have to be applied as a preventative measure, before the scar forms. However, once a scar has formed, experts say there is no merit to applying honey. Recommended treatments include laser therapy, chemical peels and microdermabrasion. Dr. Jeffrey Benabio, MD, FAAD, of the American Board of Dermatology, says the scars may even improve on their own over time, and suggests steering clear of homemade remedies and honey, which he says is merely "a myth." You should check with your doctor before smearing honey to cure acne scarring, as you may do more harm than good to your complexion. Dr. Vermen Verallo-Rowell, a leading dermatologist and dermatopathologist with VMV Hypoallergenics, also warns that "because of its physical, sticky nature, honey may induce comedone formation, such as acne, by clogging your pores." Make sure you aren't allergic to the honey itself or any plant allergens it may contain that result from bees moving from one flower to another. National Geographic: "How Honey Curbs the MRSA Superbug"
Journal of the Royal Society of Medicine: "Honey-A Remedy Rediscovered"
How Long Can Honey Last Without Going Bad? Are There Any Benefits of Manuka Honey for Wrinkles?